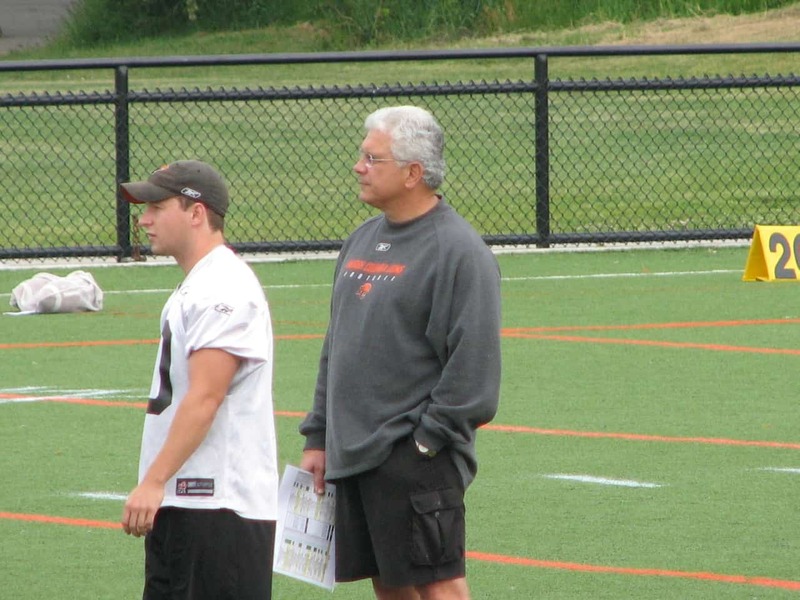 For a few hours the BC Lions and their fans got to forget about the labour negotiations that could be delaying the start of the game both sides love, and it felt like football season was about to begin. Club management, players and fans came to mingle, see the Grey Cup and get decked out in the latest BC Lions merchandise in preparation for the start of the Lions sixty-first season in the Canadian Football League. The event was well attended and fans heard from the likes of Dennis Skulsky, Wally Buono and Mike Benevides, who introduced his new coaching staff. Jamie Taras then hosted the annual fashion show of new Lions gear using the Felions and current Lions players. The players were asked to emulate famous female fashion models and the results were quite comical. Marco Iannuzzi could definitely have a career on the fashion runway when his football days are done. After a rendition of ‘Roar You Lions Roar’ fans were invited down to the field for autographs and photos with the players in attendance as well as alumni Al Wilson, Brent Johnson, Nick Hebeler and Jim Young. There was also an opportunity to chat with the coaches and have your picture taken with the Grey Cup. Here are a couple of nuggets from today’s event. Once again the Lions thought out of the box with their season ticket packages this year, which come a nice cylinder container. 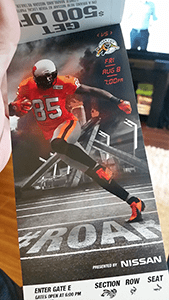 The tickets themselves are very well done and are based off of some of the dark grey, highlighted orange posters you’ve seen around the city. The tickets feature star players in front of various Vancouver landmarks. Also included in this year’s package, two 2 for 1 ticket vouchers, two stickers, two pocket schedules and a nice frame worthy poster of this years ticket designs. Clearly the Lions were caught somewhat off-guard by the amount of fans that showed up today. As a result it took a long time to get everyone into the stadium, have them pick up their tickets and then line up for complimentary concessions items. To the Lions credit, Dennis Skulksy apologized to the crowd and told the fans that it was the club’s job to deliver to their fans and that they could have done a better job of that on the day. Credibility starts at the top and it was a classy gesture on the part of Skulsky and the Lions to acknowledge the complications. Part of the slow down was the fact that Skulsky and owner David Braley met and shook the hand of every season ticket holder coming into the building, so indeed their intentions were good. While Paul McCallum was being asked if he prepares any difficulty for training camp today than he did for his first one, he appeared to be heckled from one fan in the crowd. I wasn’t sure what exactly was said, but McCallum replied “Not yet”, with a wry smirk on his face. Khalif Mitchell received one of the loudest ovations of the day and it’s clear that those in attendance were happy he’s back in orange and black. The feeling was definitely mutual as Mitchell spoke about being back in Vancouver with his “friends, team mates and family”. The Lions would leave one side of the upper bowl open and free of the drapes to accommodate those with tickets in the upper bowl and their family and Gemstone Grill sections. The thought is it would create a more intimate setting in the lower bowl. The club will be sending out a survey to fans and may experiment with the configuration in the pre-season. Travel with the Lions on their team charter. Stay in the team hotel. All prices are plus GST and based on double occupancy. Call the Lions at 604-589-ROAR (7627).